There are only three things in life that are certain: taxes, duties, and stress. Fortunately, the latter can be easily coped with, and thus it is possible to significantly increase the comfort of your life. Knowledge of basic crisis management techniques is sufficient. 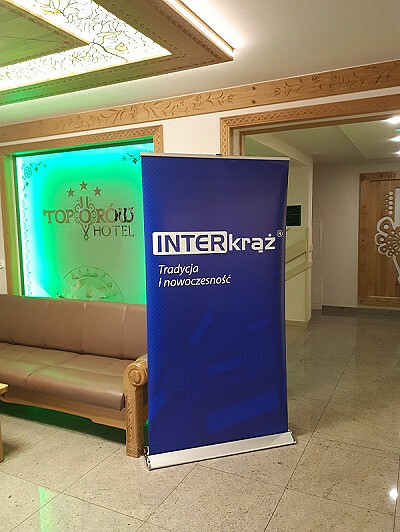 In September, several dozens of INTERkrąż employees who took part in a training in Białka Tatrzańska had the opportunity to get to know them. We believe in the idea of work-life balance, which is why we constantly strive to increase the comfort of work by creating conditions preventing the formation of mental and physical discomfort associated with realization of professional duties. This time we realized this mission during the trip, which became a pretext to learn about theoretical and practical knowledge of how to neutralize harmful symptoms of stress and great, integrating fun. September is a breakthrough period every year, which heralds change and may become a great opportunity to improve the quality of professional and private life. Several dozens of INTERkrąż employees, who in 22nd and 23rd of September 2018 had the opportunity to participate in a training on stress management techniques, know this perfectly. The meeting was all the more pleasant as it took place in the beautiful landscapes of Białka Tatrzańska, favouring tranquillity and relaxation. During the meeting, the participants got to know a lot of interesting information on how stress occurs and how it works. As it turns out, the prolonged tension can have many disastrous consequences, including those related to health problems. However, theory is not everything, especially when it comes to such a practical issue as the ability to reduce harmful nervousness. The participants also took part in workshop during which, under the guidance of specialized practitioners, they had learned exercises ensuring control over emotions, techniques of reducing physical and mental tension, and had learned the selective thinking supporting the processes of building a satisfying and fruitful professional and private life. The time spent together also became a great opportunity to integrate the crew and have fun. We are sure that two days of departure have contributed significantly to tightening of bonds and will directly translate into an even better atmosphere at the workplace.